By 1985, when my memory of the tree was formed, sweet purple figs with amber centers grew high in its branches, far too high to pick. Over-ripe figs littered the dirt yard, their seedy flesh split open, attracting wasps and squishing underfoot. 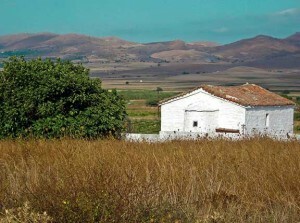 The hot summer day I met the old fig, an epic Greek family battle erupted over the house, pushing generations of wounds and slights into the open (a fascinating story, but for another day). The battle ended in victory, but after it was over, the house stood vacant for a decade. While vacant, though the house was locked and boarded, next-door neighbor and cousin Thanasis kept a pig and donkey in the yard. The donkey was chained to the old fig and paced the tiny yard, back and forth, month after month, to and fro, year after year. The chain encircling the fig’s trunk slowly but surely girdled the tree. The old fig couldn’t survive the girdling. It died slowly, every year producing fewer leaves. In the end, only naked, tangled branches were left, whistling in the island winds. With heavy heart, Steven cut it down. No more shade, no more figs, no more ancestral connection. In one fell swoop, the character of the house and yard changed forever. Losing an ancient tree is painful. We complained bitterly. Without the old fig, it was impossible to sit outside on summer afternoons. The house was unbearably hot from sun beating in the windows. The yard once filled by deep cool shade was choked with prickly weeds. Eventually, we realized with the tree gone, there was room for a garden. Between our annual visits, friends, neighbors, and cousins planted and tended flowers. Waste space was slowly transformed into garden. 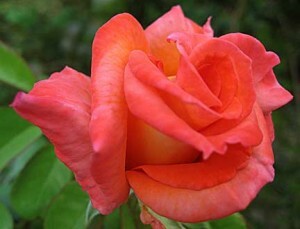 Blooming roses, jasmine, and a host of other flowers now greet our arrival. One cousin grows a vegetable garden in the yard; its fresh produce graces our table when we’re in the village. The passing of the old fig also made space to renovate a crumbling balcony. We again have shady, comfortable outdoor living space where we sit and eat and entertain, but now surrounded by a beautiful garden. While the huge fig of my memory is gone, it actually wasn’t dead. Fig trees, it turns out, are notoriously hard to kill. Even though it had been cut down to the dirt, one year later it sent up a few thin suckers from the roots. The year after that, it sent more suckers. With each passing year, the fig gets stronger and more vital. For the last five years, we’ve espaliered fig suckers into a fence that runs along our south property line, giving us welcome, late summer privacy. Though we’d never have voluntarily cut it down, it’s a blessing the old fig is gone. Thank God for Thanasis and his donkey. 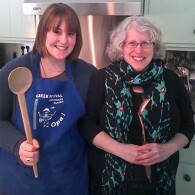 I started writing the “Mediterranean Cooking in Alaska” blog in 2007. 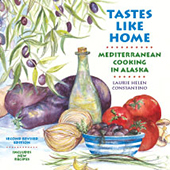 I created it to promote Tastes Like Home: Mediterranean Cooking in Alaska, a cookbook I wrote to raise money for a church in my Greek Orthodox parish. The blog quickly took on a life of its own. I regularly posted recipes and stories of life in Greece and Alaska. Mediterranean cooking will always be my first love. As time passed from its creation, I felt increasingly constrained by the limited scope my blog’s title implied and the limitations of the blogging software I was using. I wanted to write about a full range of food-related topics, and to publically answer interesting questions I was fielding from readers, whether or not the Mediterranean region was involved. Sitting on our shady veranda in Greece, surrounded by a beautiful fragrant garden, I knew Mediterranean Cooking in Alaska had to be reconceived. Taking the fig tree as my inspiration, I shifted focus from writing my old blog to creating a new one. I planned, I charted, I schemed. All posts from the original Mediterranean Cooking in Alaska will eventually be transferred to www.laurieconstantino.com; I hope to have that process complete in the next two months. This has been a complex project, and one I would not have been able to do without the wonderful team at 3 Crown Creative in Seattle: Susan Rosenbaum did the logo, Tom Collicott the site design, and Carol Deckelbaum (who is a genius) the incredibly complicated and truly amazing computer work. As for the fig tree in our Greek yard, it’s now been years since its rebirth and transformation. It is once again producing sweet purple fruit. I eat my fill of fresh figs when we’re there and turn the rest into fig jam. I bring fig jam back to Anchorage and use it in Pasta Flora, a traditional Greek Jam Tart. Travelling from Alaska to Greece, I bring raspberry jam and use that instead. Raspberries don’t exist on the Greek island where our house is, so Raspberry Jam Tart is always a treat for Greek friends and relatives. No matter where I live, even if I’m out of homemade jam, Greek Jam Tart is one of my most reliable recipes when I need to bring dessert to a party. When can I go to your place in Greece? Leaving behind your fig tree must have been really hard, but watching a new one grow will be good. Figs grow pretty quickly – depending on the the variety, you may very well have a harvest sooner than you think! As for the rabbit, I’d do the wine marinated version with whole onions so they can easily be removed from Linda’s serving. The new site looks really great Laurie! Its layout, color scheme, content are all spot-on! As for this tart, it looks simply delicious. I was so upset this year when I returned from Greece to find our fig trees here in NY did not produce the figs they usually do every September. Instead, the figs had ripened early in August when we were still in Greece. I am hoping this year they resume their normal pattern! I usually have bowls and bowls of figs and not enough recipes to use them in. Thanks Maria! I know exactly the frustration you’re talking about – when the harvest calendar doesn’t mesh with your vacation schedule. So wrong. Congratulations on this new beautiful site, Laurie! The fable of the fig is perfect for this re-do. Will stay tuned for all the fruits of your labor. Brava! I am in love…what a great post and I am so happy I found your blog…can’t wait to make this. Welcome to your new home Laurie. I look forward to reading more about the family homestead, Greek cooking and so much more!!! I was born and spent my firrst 12 years in Greece. I’ve been back many times, often visiting my grandfather’s farmhouse located somewhere in the Northern Greek countryside. And yes, some of my relatives battled over an orchard when papou died. A shame, really. My grandparents had five children, and papou planted five fig trees in his garden, one for each of the children. My mother still talks about how she and her siblings would climb up to the highest branches to gather that corpulent fruit. I’ve loved your “Mediterranean Cooking in Alaska,” and since I all ready know that you love to write, I wish you success in your new endeavor. One thing though: That poor donkey in your story must have had a miserable life. We need to admit that a lot Greeks have a habit of neglecting animals, as is evidenced by the number of strays that can be found roaming Greek cities and villages. It’s probably an outgrowth of living an agrarian lifestyle, and it is a problem that needs to be addressed. On a lighter note, that’s a beautiful pasta flora, but an even more gorgeous fig jam. Thank you for your good wishes and kind words Ana. As for the animals in Greece, they have a rough life that’s for sure. It’s very hard to watch, especially for animal lovers, which I am. Congratulations, Laurie, on the launching of your new site. It looks amazing – as amazing as homemade fig jam. You recipes are mouth watering.I love you story about fig trees. They are my favourite fruit, I wish to have them all year long…not possible on northern part of Pacific cost. 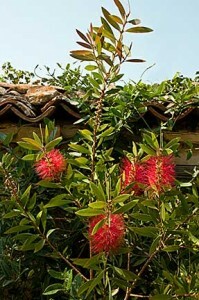 I love them most fresh when they are bursting open with sweetness ready to “jump” of the tree. Baking them with coat cheese and fresh rosemary for few minutes give them extra tasty boost. Yes, you are very right, figs baked with goat cheese and rosemary are wonderful, but fresh from the tree are always the best. First off let me say that I am very thrilled to see your return to blogging. I have missed your stories, news and most of all your inspiring recipes! Loving the ‘pasta flora” and even more so with that fig jam!